The new VHX Systems fit directly into the stock dash of the following vehicles without modification (bezel is NOT included). This 6-gauge system includes a new, machined rear gauge housing, attaching directly to the backside of stock dash bezel. Bezel shown in any pics is for illustrative purposes only, it is NOT included. Fits into stock dash. 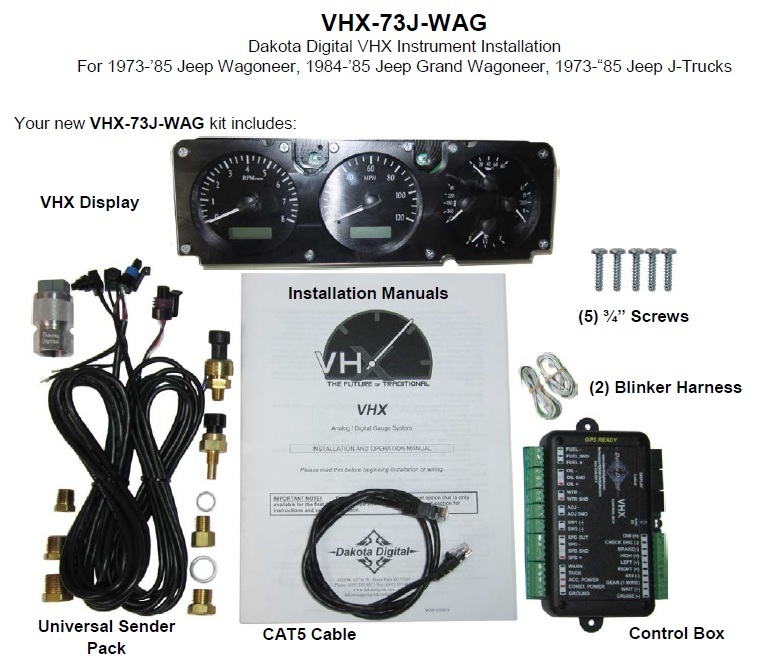 VHX-73J-WAG fits original stock dash/ bezel/ fascia/ trim, not included. Image shown for reference only. Fully lit needles, backlit faces, and highly visible LCD message centers are a few of the things that you can see which set the VHX Series apart from yesterday’s traditional approach to instrumentation. A few of the features which you don’t normally see are the micro-controlled precision stepper motors, solid state sensors for unparalleled accuracy, and user-customizable display feedback, all supported by an unrivaled limited lifetime warranty which has become the standard for Dakota Digital instrumentation systems. Completely engineered and manufactured at their facility in Sioux Falls, South Dakota, the VHX Series has completely revolutionized the instrumentation industry!